Model SD1218-300 adjusts for 12 and 18 inch handwrap. Model HD1218-300 (shown) adjusts for 12, 15 and 18 inch handwrap. Model HD1820-300 adjusts for 18 and 20 inch handwrap. Heavy duty all-steel construction with welded tubular shaft and handle. Advanced heavy duty Stretch-Set™ tension control maintains constant film stretch levels over a wide range of adjustments. Precise tension control with 1½ turns of adjustment. Six (6) quarter turns provides full graduated measure of film control. Broad base design resists tip over. Ergonomically designed padded foam handle grip for easy wrapping due to near center-of-gravity position. Model SHD1218-300 (shown) adjusts for 12, 15 and 18 inch handwrap. Model SHD1820-300 adjusts for 18 and 20 inch handwrap. 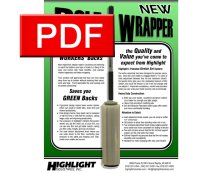 Highlight's Pole Wrapper has an ergonomic design that means you no longer have to crouch and strain to reach the bottoms and the tops of loads. Your operators will appreciate that they can now easily wrap from top to bottom without strain, and you'll appreciate the cost savings and increased productivity. The steel core and heavy duty aluminum pole design means many loads can be wrapped in half the time or with half the operators, saving wage costs and improving productivity. The precision of Highlight's Stretch-Set system allows you to get the most out of your film; you can use less film and get better results, saving you film costs and loss of product. 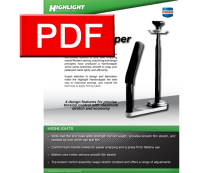 The Highlight HAND SAVER Model HS-277 two ring design. Insert the pair of rings into both ends of a 3" I.D. roll of film. Hold the stationary blue ring and the grey ring turns with the film. (75 pairs per case -- call Highlight for your best price). Sold with text as shown (p/n 755561). Sold without text (p/n 755574), by case only, directly from Highlight.